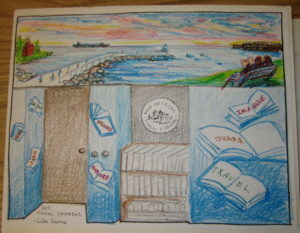 In 2008, local artist Lisa Kosmo, owner of Silverfalls Studio, first submitted a formal proposal for painting a mural in the entryway of the Two Harbors Public Library. The mural would include Two Harbors icons, such as the Two Harbors Lighthouse, the Two Harbors Ore Docks, the local breakwall, and an ore boat. 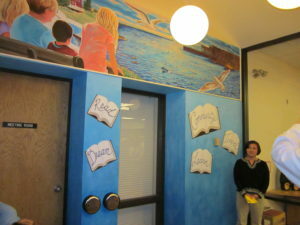 To tie the mural into the library, it would also include a family reading on a bench, overlooking the whole scene. 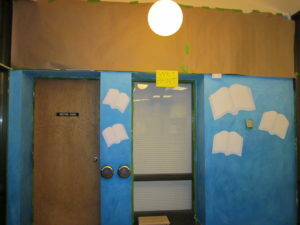 As the lower portion of the entryway contained a door, window, book case, handicap door openers, and thermostat, it would be impossible to extend the mural to the floor. 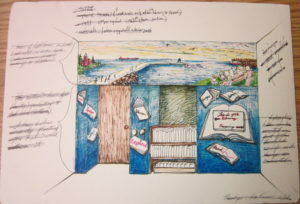 Instead, it was proposed that the artist would re-paint this area blue, to complement the upper mural, and add floating books with words of encouragement written upon them. Unfortunately, this first proposal was turned down. Lisa tried submitting a modified proposal in 2011. The new proposal was very similar to the original proposal, but had simplified the family on the bench, added some birds to the sky, and added a library logo to the window into the meeting room. Sadly, this second submission came at an inopportune time, and it was not accepted either. Lisa persevered and submitted yet another amended proposal in 2012, this time as part of the same call for Legacy Artwork that resulted in Girl Reading on a Train. This time, the submission was accepted, and it was paid for with Legacy Artwork funding as well. Over the space of a few long weekends, Lisa Kosmo proceeded to paint the mural whenever the library was closed, and kept the in-progress mural covered while the library was open, to not give away the surprise. 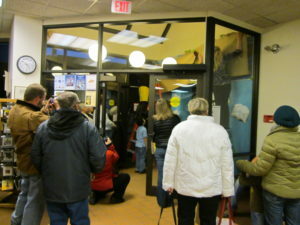 December 4th, 2012, was the great unveiling ceremony for the mural. 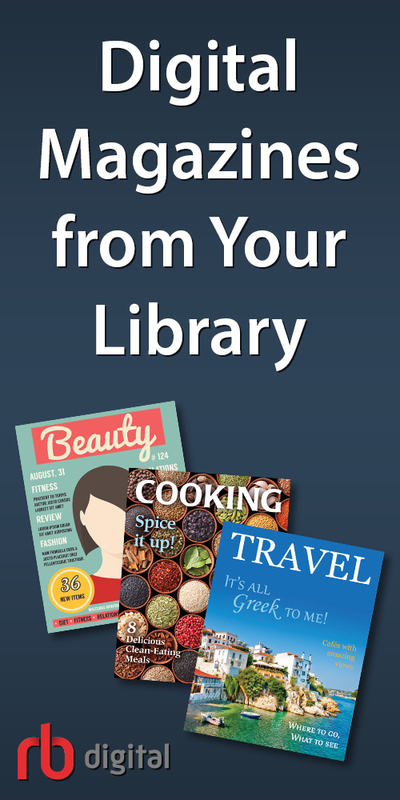 It was turned into a formal event, with staff, Library Board Members, and library patrons in attendance. 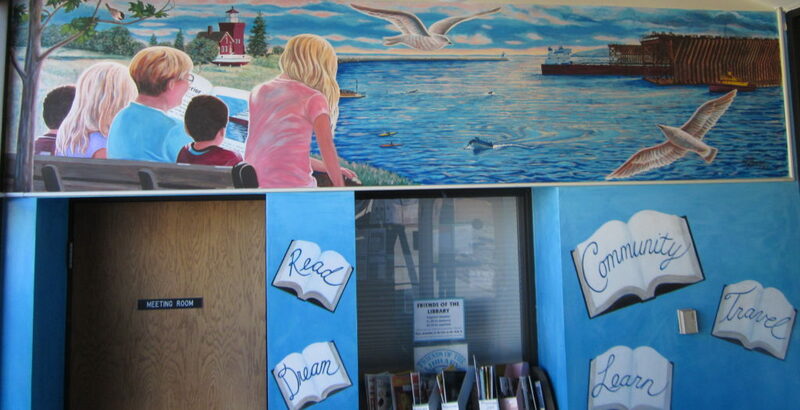 The mural brightens up the library entrance and has become one of our artistic icons. 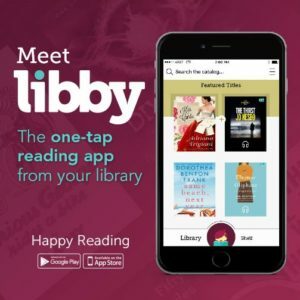 The artist, Lisa Kosmo, worked at the Two Harbors Public Library as a Library Aide for nearly 6 years. All four of the children used as models for the mural were children of Library Staff. The grandmotherly figure reading the book in the mural was modeled by Lois Johnson, who worked at the Two Harbors Public Library on-and-off for about 65 years before retiring.